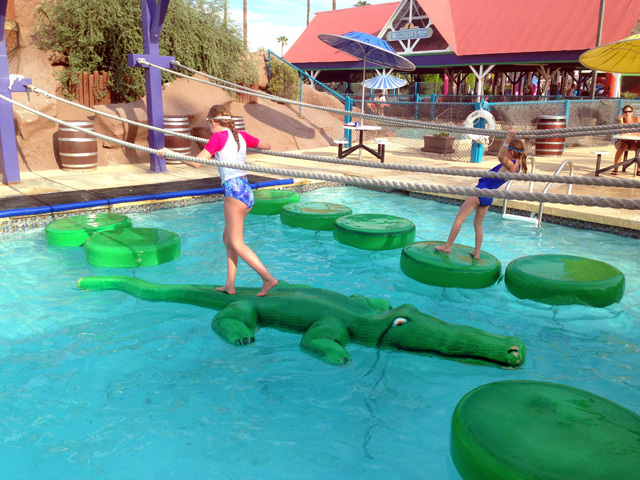 Golfland-Sunsplash, located in Mesa, Arizona, has something fun for everyone who visits. 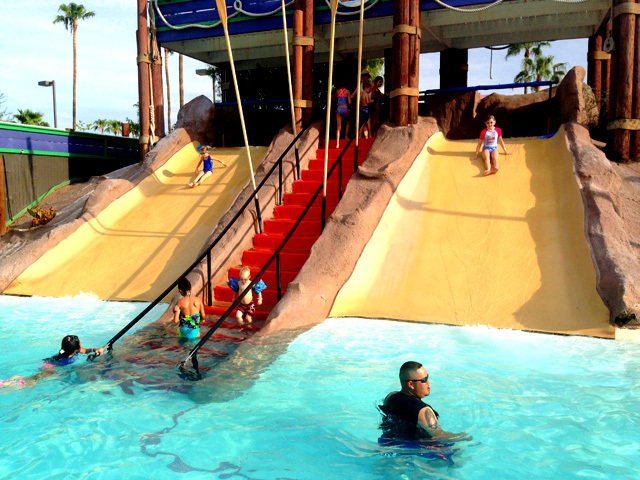 Whether you are a golf fan or love the thrill of a water slide, you will have an outstanding day at Golfland Sunsplash. This amusement park is separated into two parks, Golfland and Sunsplash. Golfland is opened all year long and features thee different miniature golf courses. Each course has 18 holes and is unique from the others. One of these miniature golf courses is named King Arthur’s Quest. At Kings Arthur’s Quest the golfers search for the missing chalice while they putt. 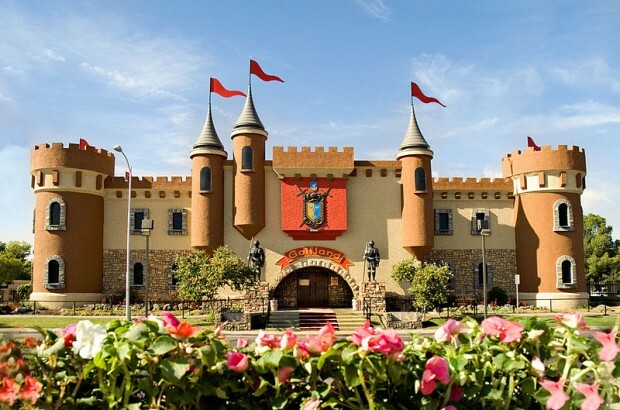 Princess Path is another great course to enjoy at Golfland as golfers look for knights or damsels. The third golf course is titled The Lost Dutchman which includes a hunt for lost gold. Within King Ben’s Castle lies an arcade packed with over 200 games for players to choose from. In the castle at Golfland, there is an epic laser tag arena, complete with state of the art equipment. A pizza restaurant can also be found to satisfy player’s hunger and give visitors energy to fuel the fun. Not to far from King Ben’s Castle a go-cart track and bumper boats are available, have competitive races and derbies in or out of water. Golfland has a slash pad for kiddos too! Little ones will have blast keeping cool, playing with hoses, and running through fountains. Kids will also enjoy a huge climbing area with 3 level, twisting slides, and a zip line. Sunsplash only operates in the summer and on spring breaks. When it is opened it features around 30 awesome water attractions and rides. Among the wonderful rides are The Revolution, The Stormrider, lazy river, and many more. The Sidewinder is steep vertical drop that sends riders flying straight down 5 stories and builds up enough momentum to zoom up the far wall. Thunder Falls is an exciting ride featuring three breath taking drops, on this ride you can ride with friends and family. Double Dare, is one of the best water slides designed for one rider at a time. It’s a drop from 7 stories high, riders reach the bottom in 8 seconds! Caribbean Water Works and Toddler Tadpole Pool are both geared towards younger children. Sunspash also has a wave pool and many water based activities. You will definitely stay cool at Sunspash. You can get free admission to Golfland-Sunsplash if you have a Pogo pass membership. A Pogo pass is an economical salutation to visit many fun destinations for a one time fee. Currently a Pogo Pass is 60% off with the promo code! Use promo code AZPLACES at check out to get the discount! Check it out, and fill your summer with excitement.